Damon is a Boston native who grew up in the projects of the South End. He’s been drawing his entire life. Damon was part of an Arts and entrepreneurship program and went to school for illustration. It’s a passion and something that is super essential to who he is. It was a natural progression for Damon to get into tattooing. What started out as a side hustle is now his full-time grind. He’s been tattooing for 8 years now and it’s the first time where a profession is constantly forcing Damon to step outside his comfort zone, expand his horizons and approach problems from creative new angles. Damon’s able to work in a variety of styles; fine line, black and gray, neo traditional, traditional, bold, soft, big, small, etc. 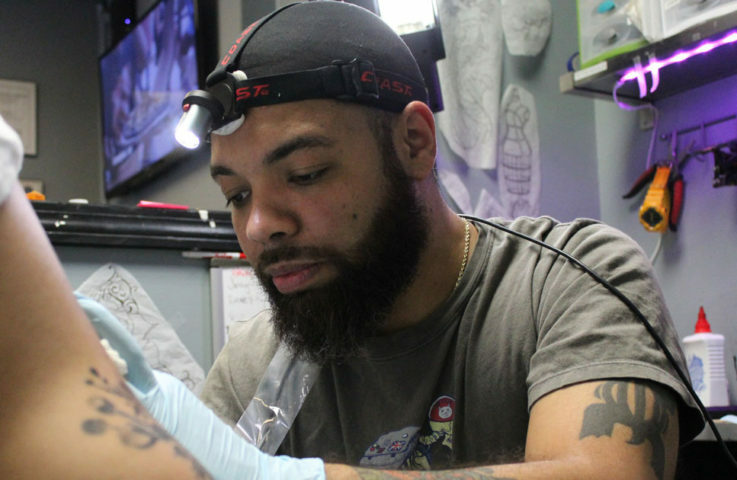 He’s not married to any particular style of tattooing because each project requires different approaches and he likes being able to give clients something unique and catered to their tastes.